helpWhat about processing costs and banks? helpWhat is your business model? helpWhat's the difference to competition? By choosing a lightweight consensus algorithm and incentivizing publishers to install network nodes on their existing hardware we get powerful processing network at nearly no cost(1). We provide mechanism where users save arbitration costs by adding funds to their accounts via creators they trust(2). Bank fees are minimized in this case as the network helps find optimal local bank connections, which are often free on many user banking plans(3). Cryptocurrency is considered as an electronic form of fiat, USD. Balancing money supply and demand is controlled by publisher voting, making speculation or investment pointless(4). Token emission is distributed among transfer recipients(5). To protect the network against attacks and spam a small part of the transfer is temporarily locked on the recipient account. Publishers can reduce the lock time by installing a node. Participants who accept commission-free payments can use their local thank-u node to perform immediate transfer validation. Users get a one-click way to donate or transfer any amount starting from 1 cent commission-free without having to register or login. They add funds to their accounts via creators, publishers, bloggers they like and trust making sure their real money doesn't flow to ICO beneficiaries, speculators, banks or advertizers. No more clickbait and distracting ads. thank-u is decentralized and controlled by transfer recipients in a meritocratic manner according to the consensus algorithm. To enable microtransactions a cryptocurrency is internally used. To achieve frictionless and free transfers we promote the primary function of money, medium of exchange, trading off fitness for derivative uses. All important parameters are voted by the recipients, e.g. whether it is time to emit more cryptocurrency or absorb some, how long a transfer commission should stay locked to protect the network or it is time to implement new features. The method of achieving distributed consensus is a variant of PoS (Proof-of-Stake) - PoB, Proof-of-Benefit, where chances to sign next block depend on current volume of transfers an account receives and are decreased once the account gets rewarded. It allows to run lightweight network nodes on servers without increasing electricity bill. Blockchain maintenance is rewarded by reducing transfer time. While all recipients get 100% of their transfers, miners get them faster as a reward for the network maintenance. in case of initial supply deficit users can add funds to their accounts using a special warm-up seed - wikimedia.org. Network will add funds to user account once it gets PayPal donation confirmation. Later, miners, who are most interested in increasing transfer velocity, vote for token emission or absorption to balance supply and demand. Newly emitted money are distributed randomly among active users. thank-u tokens have no added value and can be seen as superconductor for your transfers. In a centralized system your funds are kept by an organization which results in certain risks, service costs and your privacy disclosure. In a decentralized one, funds are converted at exchanges with a conversion and bank transfer fees applied. In thank-u you choose whom you trust to add funds to your account. It may be you favorite author, website or organization. Install thank-u browser extension and go ahead making one-click microdonations whenever feeling like supporting somebody or just saying "thank you". You can also automate the process and let a monthly amount of a few dollars be automatically distributed among the sites you spend most time on. The grass will always be green whereever you walk. The money you transfer are garanteed to get to your donatees. Here is how it works. You first add funds to your app wallet by directly transferring, say 10 dollars, to your favorite one you trust, using their banking data published on thank-u network. They will add these funds to your account. You can now split it into microdonations as you come across content you like. No commission, no losses. The idea to route people emotions via likes is great. thank-u improves it addressesing its current weaknesses. Being worth nothing internet likes are often faked. There are numerous providers that help one get or buy fake likes. The minimum price of a like in thank-u is 1 cent. That makes them matter and more difficult to fake. There are many proprietary like-based profiling systems around. Some do not much better than filling your sight with spam and advertizing whereas there is demand for an open, transparent database and recommendation services to save time when choosing a movie to watch or and article to read. 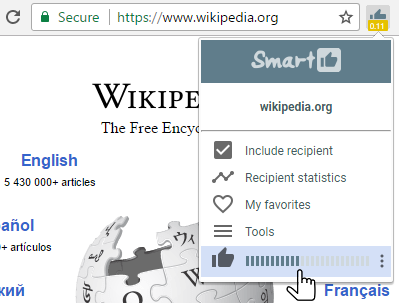 Here is one example - smarlike.org. Many vloggers ask for direct donates in addition to likes. Likes help them get a share of advertizing money which is obviously too small in many cases. Look at the money flow: content consumer -> a product manufacturer -> advertizer -> publisher -> author. thank-u shortcuts the intermediaries. Likes of other people are often worth spam. Your likes disclose your privacy. With thank-u you can save your time and profit from recommendations without disclosing your privacy. Enabling users to transfer you money for your services or content with thank-u is just about adding a few lines of code to your web page. If you wish to identify your user to lift off paywalls or personalize content, without forcing them to disclose their identity and remembering new passwords, place a couple of lines of code on your page, like here. Application toolbar icon will change color indicating that the site unobtrusively invites to login. Users will be able to securely login via browser extension without registration. You will identify them by their thank-u account and see if they previously bought services from you without knowing who they are. Additionally, you may want to build paywalls for your content, asking users to login or choose a plan to buy, e.g. like here. Here you can find code to enable one-click purchases. When you install your local thank-u node you can immediately validate user transfer and lift paywall, start showing a content or shipping product. How do we normally pay for content now? thank-u app helps you support your favorite sites directly. You decide what content you like, you control your money. Smartlike signature is used by the app to route likes and donations to creator. Add a visible or hidden line to your page: "[smartlike:your name or account id]". example. 2. Map your domains to your account to route likes and donations without having to sign separate pages. 3. Publish your payment connections to help your audience add funds to their wallets. Q:What about processing costs and banks? A: Processing is taken care of by beneficiaries - main transfer recipients - authors and publishers. As they often have servers up and running, installing a tiny thank-u node software won't cause additional costs. As to bank comission see the details here. A: There's blockchain and cryptocurrency implementation inside, but it's impossible to finance investors, speculators or even developers. It would inevitebly compromise the goal of the project - lossless transfers. See how the leaks are handled here. Q:What is your business model? A: The same one we propose for funding internet content. If we succeed to deliver value to the internet community, it will support us by visiting our smartlike browser, ledger monitor and other tools and services we develop. And there'll be no ads there. There are a few competing systems around. We believe that a good solution should: (1) be free, (2) work anonymously without registration, (3) be transparent and decentralized so that no single entity needs to be trusted to wire transfers, (4) be open, i.e. work for all types of sites and apps, capable of going beyond the Internet into the real world, (5) be controlled by the community, not just a single company that can be sold or go bankrupt, (6) have no built-in compromises.